The Elements Series<sup></sup> provides an expanded choice in Fashion Doorware at an affordable price. In decorating your home, choosing the right paint, wallpaper, tile and trim is important in creating a personal design. The Elements Series of Fashion Doorware will support and enhance your decorating decisions. Classic lines and enhanced styling make Yukon a great choice for many home designs and the perfect enhancement for traditional or contemporary homes. This half-dummy, or trim function, is surface mounted on doors where only a pull is required. The crisp, clean appearance of the Satin Nickel finish adds to the overall look of the product and brings a modern feel. Featuring a Lifetime Guarantee, DEFIANT meets or exceeds ANSI Grade 3 Standards for residential use. This 4 pack lock set features a drive in latch with an adjustable backset and optional radius cut faceplate . The Powder coated finish will provide years of durability. When used as a replacement lock only a screwdriver is need to make installation a snap. Featuring a Lifetime Guarantee, DEFIANT<sup></sup> meets or exceeds ANSI Grade 3 Standards for residential use. This lock features a drive in latch with an adjustable backset and optional radius cut faceplate . The Powder coated finish will provide years of durability. When used as a replacement lock only a screwdriver is needed to make installation a snap. 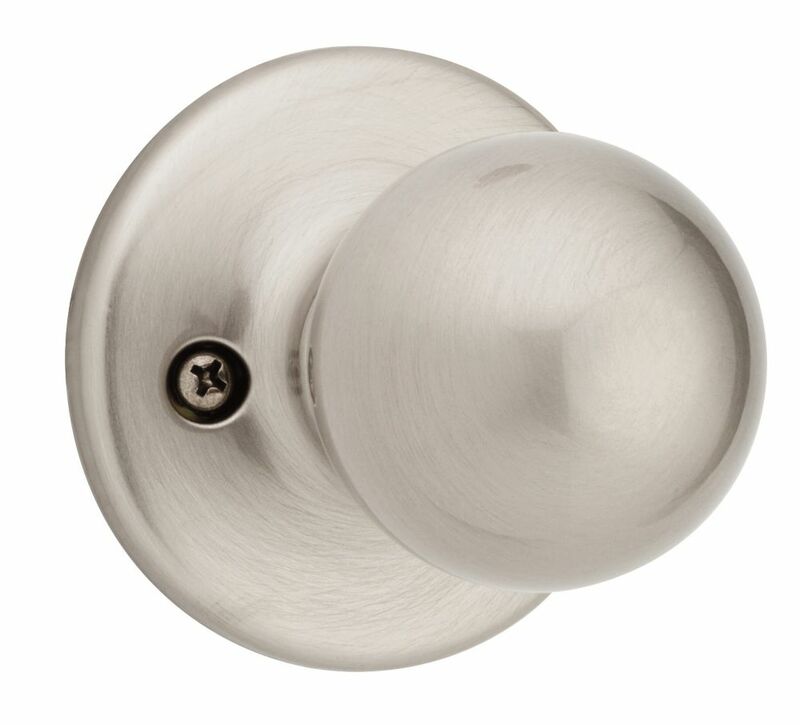 Yukon Dummy Knob in Satin Nickel The Elements Series<sup></sup> provides an expanded choice in Fashion Doorware at an affordable price. In decorating your home, choosing the right paint, wallpaper, tile and trim is important in creating a personal design. The Elements Series of Fashion Doorware will support and enhance your decorating decisions. Classic lines and enhanced styling make Yukon a great choice for many home designs and the perfect enhancement for traditional or contemporary homes. This half-dummy, or trim function, is surface mounted on doors where only a pull is required. The crisp, clean appearance of the Satin Nickel finish adds to the overall look of the product and brings a modern feel.